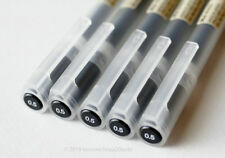 MUJI Gel Ink Ball Point Pen 0.38mm Black color 5pcs. made in japan Moma ballpoint. ･Quantity: 5 Ballpoint pens. I participate from Japan. So I can provide you the best service. ･Made in JAPAN. ･C olor : Black. Enjoy the smooth writing of this Moma Muji gel ink pen. This ink pen features a 0.38 millimeter ball tip that allows the gel ink to glide out smoothly. It does not skip or release blobs of ink, which ensures that your writing is easier to read. The pens are easy to hold and have a smooth finish for comfort in your hands. This is a set of ten black gel ink pens, and the pens have protective white caps. pen works great. i was running out of ink from my old pen so i was looking for something new to try. this pen writes smoothly and doesnt have any annoying dryness so far. also doesnt leak. package came nice. this pen writes in .38 so its a good thin for writing notes or sketching. I absolutely love these pens. I recently discovered them by accident when I found one. It writes so smooth as easily. I received them today in the mail and i just ordered them a week ago so I’m very impressed with the shipping time. These are much lighter than pens I usually use so they took a little getting used to, but I quickly learned to love them. Very smooth writing. They came packed in a neat envelope inside the shipping envelope and would make a great gift for anyone who writes a lot by hand. The pen is easy and light to hold. Bought it for my bullet journal, but started to use it to everything else as well. Loved it!! The delivery time was realy fast as well. Okay so I ordered these, haven't tried these pens and I love how fine and clean it is, I tried all the pens out at least one line to make sure they all worked and they did! Plus they came in like 2 weeks earlier than expected!